Sunday March 27th 1921 It was much cooler today. The girls both went to S S and church. I put away the things in my bag and wrote to Vene & Ida. Rob brought my trunk and I unpacked it after dinner. The folks from the other house here for supper and to spend the evening. LeGrand goes to Oak Dale to begin work in the hospital tomorrow. Monday March 28th 1921 It was cold and I did not feel well so did not get up till nearly noon. Cora & Hattie both away in PM. I read and wrote some. Hattie & I alone in evening. I talked of my trip. Tuesday March 29th 1921 This is Lee's birthday and three years today since Dear Will and I left Oklahoma City together. I went to town with Hattie in afternoon to call at Mrs Thomas where Mother had died. Later we were at Mrs Swishers to see Helens new baby. We walked down town. Come home with Rob. Mollie over to stay all night. Wednesday March 30th 1921 Down to Fannies in forenoon. Cora took me to town soon after dinner. I had a treatment for my hair. Hattie and Fannie went to Mrs Close funeral. William brought us home. It rained a little. I wrote Aaron Garrett in the evening. 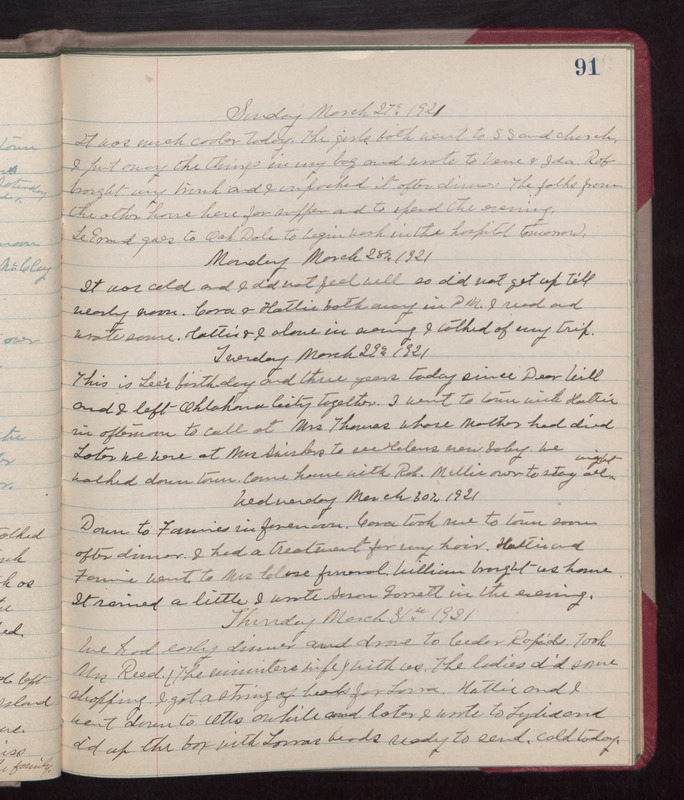 Thursday March 31st 1921 We had early dinner and drove to Cedar Rapids. Took Mrs Reed (The ministers wife) with us. The ladies did some shopping. I got a string of beads for Laura. Hattie and I went down to Otts awhile and later I wrote to Lydia and did up the box with Lauras beads ready to send. cold day.